Dense, long-lasting Nyflex nylon brushes flex more than bronze brushes, so you can scrub back and forth in tight spaces without getting the brush stuck or risking damage to the bore. Kit contains distinctive blue brushes precisely sized to clean the upper receiver, chamber, bolt carrier, and bore of any AR-style .308 rifle. Tightly-wound bristles offer more cleaning area per inch, and the solid brass brush core won't scratch steel or aluminum. 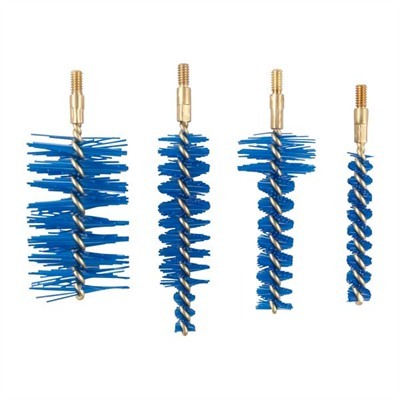 Mfg: Iosso Products SPECS: Blue Nyflex bristles, brass core. 3" (7.6cm) long. 8-32 male threads. Contains one each: upper receiver brush, chamber brush, bolt carrier brush, bore brush.